A perfect summer supper, this recipe was adapted from “Sunny’s Grilled Pasta Salad” featured on Food Network. Their version was grilled outdoors, but when it’s raining cats and dogs what do you do? Wing it! 1. In a very small bowl, combine the salt, black pepper, cayenne, and paprika. Generously season the chicken with the spice mix and set aside. 2. In a heavy skillet, cook the bacon until crisp. Remove the bacon to a paper towel lined plate and set aside. Drain all but a tablespoon of bacon grease from the skillet and discard. 3. Heat the remaining tablespoon of bacon grease over medium until hot. Add the chicken and cook until golden brown on the first side, then flip and continue cooking until done. Remove from the skillet and set aside to cool. When cool, cut into small bite sized pieces. 4. Raise the temperature in the skillet to medium high. Pat the thawed corn with a paper towel to remove most of the moisture and add to the hot skillet. Stirring almost constantly, cook the corn until hot and just beginning to show some color on the edges. Remove from the heat to cool. 5. For the pasta: Bring a pot of water to a boil and season with salt. Cook the pasta to al dente according to the package instructions. Drain and transfer to a large bowl. 6. For the dressing: In a small food processor, add the mayonnaise, half of the avocado, scallion, lime juice, a pinch of salt and a few grinds of black pepper. Blend until smooth. If needed, add a splash of water to thin to desired consistency. 7. For the salad: To the large bowl of pasta, add the dressing and mix to combine. If desired, transfer the dressed pasta to a large platter or divide among serving plates. 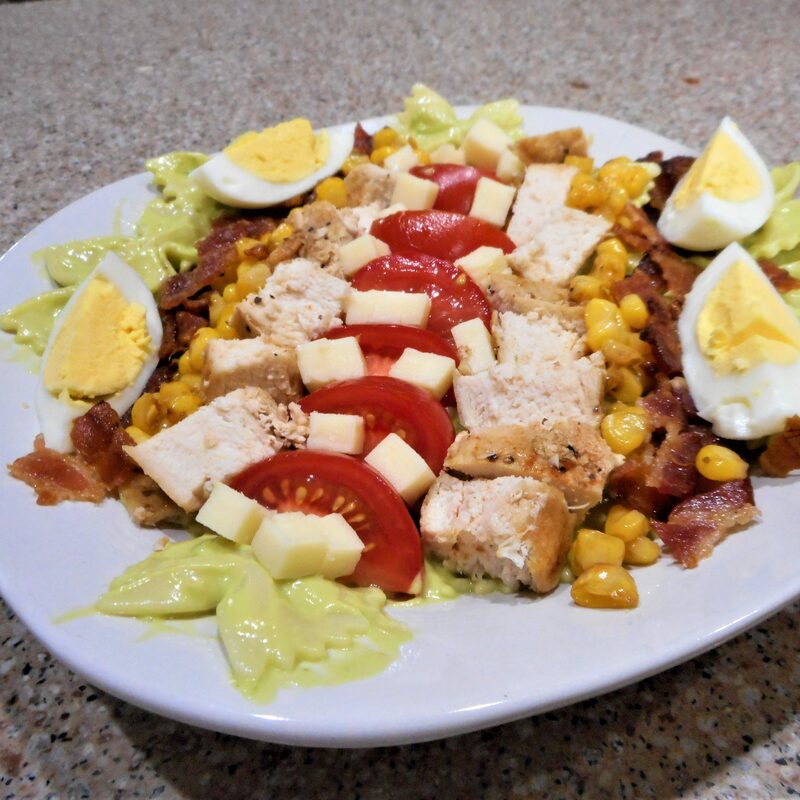 Arrange in rows the chicken, corn, remaining avocado, tomatoes, eggs, crumbled bacon and cheese on top of the pasta salad.